On or around August 1st our borrowed bull will arrive. Between now and then I have to plan my grazing through my reserve grazing area. Our heat-sensitive heifer needs us to plan for shade. Our Jersey cows need to be AI’d before the bull arrives and we have to have the cows away from the perimeter fence so the borrowed bull and the neighbor’s bull don’t try to duke it out through barbed wire. With me? Lots of planning to do. I need 15 or so days of grazing then I need to return to the top of the hill under the walnut tree where we can keep an eye on Mr. Bull. Here’s the plan in picture form with thanks to Google Maps. The projected (planned(hoped for(please God!))) 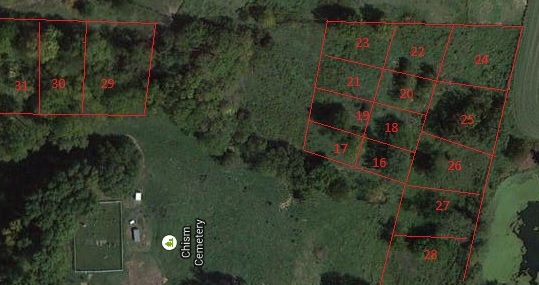 dates are listed on the map in the order they will be grazed. Well, that’s the rough plan anyway. Now, I’m not following keylines. Well, I kinda am. The lines marked are approximations, just giving an idea. I am a little concerned about 23 and 24 as there is little shade available in those pastures. I will probably give them access to 22 for 3 days so they can find refuge from the sun, though I am concerned about the concentration of manure under those few hedge trees. Don’t worry that 27 looks much larger than 16, the grass under the pond dam is very poor in quality. If feed runs short I’ll drop a few bales of hay. It is important that the cows return nutrients to each paddock even if I have to import them. If you want to see this area from ground level in winter, check out this post. For readers of some duration, 17 is what the kids call Disemmemberment Hill“…sledding directly into massive, tangled, thorny hedge trees at the bottom of the hill. Should be less disemmembering this winter as the cows and I have cleaned it up a bit. In fact, over time it should become less and less disemmembering as I cut firewood and the cows make the slopes more gentle. That’s the plan anyway. At least I’ve got a plan. To be honest, most of the time we wing it but I’m trying to do better. Who knows where I would be when that bull gets here if I didn’t try for something. I just found your blog and appreciate your insights and efforts into “repairing” your farm. When you say the cows will clean up the brush, how much of the brush will get cleared? Will the cows eat invasive plants like poison oak? Do you want them to eat poison oak? I’m interested as there is a chance I may be starting a cow on a new area. By moving a tightly-packed mob from one pasture to the next rapidly the cows just eat everything in sight…well, thankfully not gooseberries. The tannins in tree leaves plus the high protein make them highly desirable (tannins help fight bloat too). The cows will knock down dead or weak limbs to get all the leaves they can reach. Essentially the cows prune everything they can reach leaving a stomped, manured, cleaned open area under the trees. So, yeah…I’m using a group of 1200 pound bulldozers to clean, nibble, knock down and stomp down brambles, poke plants, poison ivy and lower limbs…cleaning it up. When the pastures were continually grazed there were certain areas the cows would loaf on hot days, mostly in the creek. Now they are forced to loaf in a new place each day which means the pastures get a chance to rest as do the creek beds. Poison oak (which I’m not sure I can identify) is not much of a concern weather they eat it or simply stomp it. However, Julie got poison ivy from our goat when the oil rubbed off onto the goat’s bag. Look out for white snakeroot as that can kill you in the cow’s milk. If you have a really thorny, brushy, nasty area you might think about a pig instead. One other note, if you need your cows to expand their dietary options you could train them to eat weeds (a la Kathy Voth) or you could, more simply, increase their mineral supplementation. If they are getting everything they need in terms of mineralization, they are more likely to get positive feedback from their rumen. Are the cattle easy to move around when it’s more than just the adjacent paddock? Like when you have to go from 28 to 29? With the visiting bull? Flora is our lead cow and she’s very tame. Julie walks beside her leading the way, the other cows follow along. For sure we make a corridor of temporary fencing to limit the chance of something unexpected happening but, for the most part, it stays pretty calm. Lead cows pay the bills. Read up on Gordon Hazard’s steer named Ug or these. Oh, a tame lead cow – how wonderful. I move my mob through lanes of electric fencing when we need to jump across areas, and it is always a breath-holding experience for me. Would love to have a tame girl at my elbow to smooth the evolution. Kudos on your planning. I wonder how you find the time but that’s just me being jealous. I need to do some of this bird’s-eye view planning myself, instead of just winging it like I am. Great idea to use google maps like this. I am hoping we can AI my bunch successfully and therefore not have to borrow a bull. Around here, no one trains their livestock to electric fence, nor do they handle them much, so finding someone to bring a breeding bull on premises and be able to load him back up in 45 days is asking a bit much, I’m afraid. All my neighbors just run their bulls with their herd throughout the year and take whatever calving season they get from that. They get their cows bred, at least. Making that happen has been weighing very heavy on my mind lately. I think we’ll run the dairy separate from the beef cows at the next freshening. That means I’ll have to train a new lead cow. Gordon Hazard says you can’t pick one but once you see a volunteer you spend the next few months building trust with it. He has a program including alfalfa cubes and a bucket for selecting a volunteer. You know, you could just go with multi-wire fence around somewhat larger paddocks to contain the bull. I’m thinking about going with polybraid instead of polywire too. Dad has a video of some friends in Colorado loading a bull without a chute. Pretty amazing. Just a couple of horses and ropes and the bull was loaded. The story about Clifford and Buddy being lead steers and kind of babysitters is interesting, thanks for sharing.